Patrik has been in the design and fashion industry for over 20 years. He has taught PMC classes and held workshops around the country including the first ever PMC workshop at the Fashion Institute of Design and Merchandising. 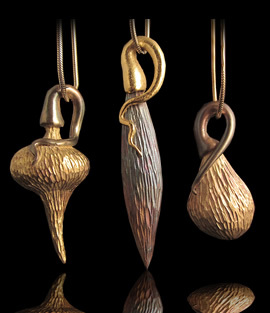 His work has appeared in numerous publications including Art Jewelry, Lapidary Journal, MJSA, and various books such as CeCe Wire's New Directions in Metal Clay: 25 Creative Jewelry Projects, the 2007 PMC Guild Annual and 500 Pendants and Lockets. In addition he has appeared on HGTVs "That's Clever" television show. He is a member of SNAG, ACC and the PMC Guild. Patrik also won 1st place in the PMC Division of the Saul Bell Awards in 2007. Materials fee: $5.00 for shared use of UV resin and use of curing lamp.